I’m really disappointed it came down to that, but sadly, there doesn’t appear to have been any other option. Since I was slightly busy on the weekend, it’s taken this long to follow up on the matter here, but now I’ll see about putting up what’s been going down since my last blog post. 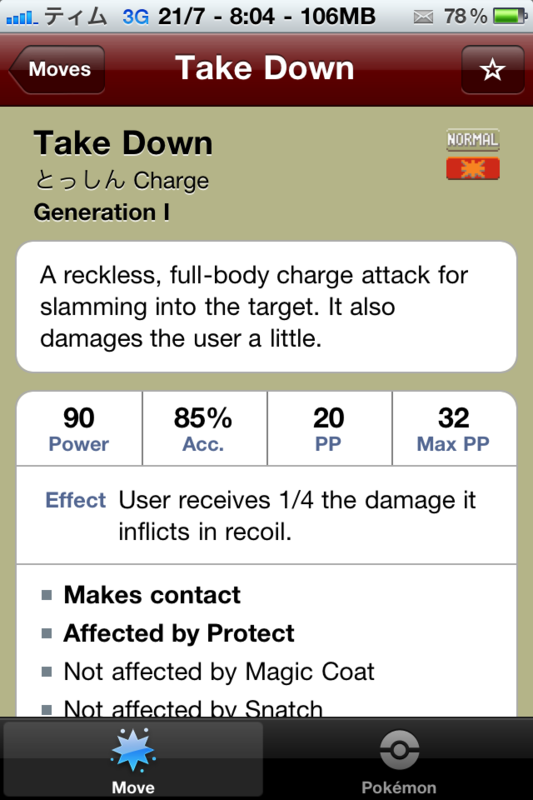 My name is Tim Oliver and I am the sole developer of the third-party fan-made Pokémon application ‘iPokédex’ for iPhone/iPod touch (http://bit.ly/ugs_ipokedex). I am a big fan of Pokémon, having played the games since the original Game Boy release, and have been developing iPokédex as a hobby with the aim of providing a quick and more streamlined encyclopedia reference for fellow Pokémon fans on the iOS platform. At the moment, the overall response to iPokédex has been overwhelmingly positive. It is currently nearing 250,000 downloads, holds an average 5/5 star rating, and for a brief while, was the #7 most downloaded app in Japan. A few people have even stated in the reviews that although they had never tried Pokémon before, they became hooked on the games after they tried out my app, and then decided to try out the games as a result. I recently received a message from Apple that the Pokémon Company International has filed a copyright infringement notice with them with regards to my app, and they have subsequently directed me to this email address. I would first like to say that it has never been my intention to infringe upon the Pokémon copyright with this app. After comparing a variety of other fan-made productions and how they had used the Pokémon content, I concluded that usage in this way would constitute ‘fair use’ under sections 107 through 118 of the United States Copyright Act and that the Pokémon Company International would have no reason to want to enforce its copyrights in this instance. In regards to this, can you please clarify with me the nature of the copyright infringement notice and why it was served? In addition, please let me know what steps you would like me to take as a result of it. In accordance with Apple’s request, I will be removing iPokédex from active distribution on Wednesday, the 13th of July at approximately 11:00pm local time (GMT +8). It will remain in this state until such time that this issue has been resolved in agreement by both parties. I would like to emphasise that my only goal in developing iPokédex was to create something that would help enhance the game-playing experience for fellow Pokémon fans and that there was no ill-will or intent at all in its implementation. I hope the Pokémon Company International can appreciate this notion and would be able to see fit to allow iPokédex to continue, or at the very least, investigate the possibility of a similar official service. I’m the <position omitted> for The Pokémon Company International, Inc. I’ve been given to understand that you’ve exchanged some mails with our legal department to try to get some information about iPokédex and more specifically about why we asked Apple to have it removed from the iTunes store. Since you’ve reached out to us and been reasonable about this, I wanted to take a moment to write you back and give you some insight into our thinking. By way of background, and sorry but I do have to get legalistic for a minute, you have told us that you think your apps are fair use under US law. Unfortunately that’s not the case. There are lots of websites that purport to give information about what is and isn’t fair use, but I find one good summary is from the US Copyright Office at http://www.copyright.gov/fls/fl102.html. (Even though you’re in the UK, the iTunes store is based in the USA and so it’s the US law analysis that applies.) Under US law all uses of a copyrighted intellectual property by anyone other than the owner of the IP are presumptively illegal, and it’s up to the person using the IP to demonstrate that their uses are permitted. So fair use isn’t an affirmative permission to do something, it’s a defense to an action that is otherwise illegal, which means that it’s your obligation to prove that you should be allowed to make apps based on Pokémon and unless you can prove that you’ve got a legal right to do that, your apps are infringing. One thing that’s not commonly-understood by fan communities is that the owners of the Pokémon IP have the right to decide not to put this IP into iTunes or anywhere else. Put another way: if we don’t create our own iTunes app, that’s not an invitation to other people to fill what they perceive as a gap, it’s a decision that they have to respect. You may think that iPokédex doesn’t compete with our print strategy guides like the one for sale at Amazon (http://www.amazon.com/Pokemon-Black-Version-White-Official/dp/0307890600/ref=pd_sim_b_1), the Pokédex 3D for the Nintendo 3DS, or the one available for free at our website www.pokemon.com. But as you can see from the Copyright Office link that’s not the only criterion in the test, and even if it was I’d have to say we don’t agree, and in any event we have chosen not to allow any iTunes Pokédex-style apps for Pokémon. You’ve pointed out that you think your apps are similar to other apps and sites that are out there. Unfortunately that doesn’t end the inquiry either. For example, imagine a situation where there’s a website that is doing everything that you are doing, but with our permission. That fact would change everything: their situation wouldn’t be fair use at all, because it would be done under a license. Of course, there are plenty of cases where things are going on and we haven’t granted a license. We’re not in a position to grant a license to every site and app out there, and in fact there are plenty of other people who are infringing the Pokémon intellectual property without one. All I can say about that is that we’ve sent a lot of notices like the one you got, we’ll be sending more, and people who decide they would like to keep infringing the Pokémon IP will find themselves receiving a different form of communication from us. I hope this helps you understand the situation and our position. You’ve been very respectful of us and our IP throughout your communications, and I hope you’ll feel we’re treating you the same way. I can’t ask that you agree with me, although I’d hope that after you’ve read this you’ll know that we didn’t act capriciously or lightly. But I do have to ask that you take iPokédex out of iTunes and not upload it anywhere else. Could you confirm to me by return email that you’ll do that? I’m sure that you’ll find another way to contribute to the iTunes app community and wish you best of luck. And that’s how the cookie crumbles. The notice is very similar to the one my buddy Nolan Lawson received and after conferring with him in private, I can confirm this is the same person who contacted him. Thanks for your email. I’m glad to be hearing from you personally; I’ve recently been in touch with Nolan Lawson (The developer of Pokédroid) and he told me that you were the one who contacted him as well. I had figured I would most likely be receiving correspondence similar to his. Thanks for the clarification of the fair use limitation. After reading what you said to Nolan regarding fair use, I went away and did some extra research of my own. While I believe iPokédex does fit into at least two of the deciding factors outlined in the doctrine, like you’ve said, there are other factors, and even then, I have no substantial way to justify my usage of the IP. Thanks also for the clarification of the App Store jurisdiction being contained to the US (Incidentally, I actually live in Australia), as I was actually wondering if that was actually the case when I released iPokédex into the Japanese market. It’s a very curious point you raise about the active decisions not to put the IP into certain mediums such as the iTunes store. You’re right in that it’s something I would have never considered, but it also leaves the entire situation a little vague as to what kinds of fan productions would actually be tolerated by the Pokémon Company (if any) and which ones wouldn’t. Suffice it to say, it’s definitely been established at this point that third party smartphone apps aren’t acceptable. That being said however, with the recent reveal of the official ‘Pokémon Say Tap?’ app for iOS and Android, it is good to see the Pokémon IP officially entering the smartphone market. Ah, sorry. I think I should clarify what I meant by my app being similar to other apps there. I simply meant that over the period of development up until releasing iPokédex, I decided to observe a lot of the other apps out there that had similar license conditions as what I intended for mine. Since to my knowledge the Pokémon Company hadn’t officially sent out any notices at that stage, I had assumed that the Pokémon Company didn’t see the need to enforce its copyrights in those regards. Obviously the situation has changed since then and I recognise that now. I must admit, I don’t think I’ve actually heard of any officially licensed third-party sites or apps in that regard. Is that something I could potentially follow up on? Is there someone else at the Pokémon Company to whom I could make an inquiry? now. iPokédex was meant to be just small, fun production to help out fellow fans and it was never my intention to threaten or cause any any inconvenience to the Pokémon Company. This is formal notice that I have removed iPokédex from distribution as of Friday, the 15th of July. You don’t have to worry about me uploading it anywhere else; doing so would be a direct violation of the Apple Developer Agreement and would result in the immediate termination of my account. Thanks you very much for your time. Like all of the projects I do in my free time, by building iPokédex I was hoping to gain new knowledge and expand upon my experiences. I can definitely say at this point that I’ve managed to achieve that. Please acknowledge receipt of this email so I may report back and sign off on the issue with Apple. Obviously this is a very open and shut case. TPCI has decided that it doesn’t want any third-party ‘Pokédex-style apps’ on any smartphone platform and is currently doing a blanket sweep on all of the app marketplaces requesting any apps that meet that criteria to be taken down immediately. What will become of the other apps (eg the Pokémon walkthrough apps, soundboard apps, background image apps etc), I’m not sure, but I get the feeling they’ll be probably getting the same response. Undeniably, I’m feeling a bit burnt at all of this. I’m really not sure why they’d want to get rid of all of these fan produced apps. If these apps were directly competing with only the paid strategy guides (and if the content was exactly the same, but I’ve checked, and it’s not. The guides cover WAY more about the gameplay than my app does), I might understand it. But considering there is after all, a free Pokédex app on the 3DS, and a free Pokédex web app on the official site, I’m still really not sure what their motive is for going through all of the effort in shutting all of these apps down. Surely these things can’t be causing any harm to the brand or any financial harm to TPCI (Well. The free, non-paid ones in any case ^_^; ). Either way, as it has been made plainly clear, the decision is ultimately TPCI’s, and they’ve decided they don’t want fans doing this with the Pokémon IP. And since I’ve been personally asked to take it down, of course I will respect that and comply to the best of my ability. On top of that, I’m really grateful that the lawyer who contacted me went out of their way to explain the situation to me in full (and considering the last email I got was at 12 in the night, that’s probably a very huge thing). They wouldn’t have made this decision, and it overall sounded like they were quite sympathetic to my situation. What’s in store for iPokédex at this point, I’m not really sure. At one point, I was considering open-sourcing t; mainly so other developers could help contribute to the feature set and localizations. Unfortunately, copyright issues aside, if I did that now, it would look like I was blatantly trying to spite TPCI. A few people have already suggested I re-release it on Cydia as well, but putting the fact the lawyer asked I don’t release it anywhere else aside, doing so would be a violation of the Apple Developers Agreement and could potentially get me banned from developing any more apps.